Not long ago Eila Walker’s choices were limited: death by a bullet to the head, or at the hands of her beloved bodyguard, Raef. Now, five weeks after Raef triggered her power and she nearly leveled a historic mansion, Eila is dealing with the fall-out of her decisions. While she doesn’t remember dying in the arms of the soul thief who loves her, she knows that Raef remembers everything about the night he nearly killed her. I don't how else to describe this book other than that it was ABSOLUTELY AMAZING! I loved reading the first book in this series, Undertow (go HERE to read my review), and this sequel was equally as great! It was fun being able to dive back into the world of Eila and her friends, and this time it was also in Raef's point of view which I was thrilled about. This book picked up a few weeks after where Undertow left off, and continued into Eila's new world and knowledge of the Lunaterra and Mortis. I already mentioned this in my review of Undertow, but I just want to say again that I really loved how well Ms. Conway handled the relationships in this book and let it grow and develop throughout the course of the entire story, instead of all at once. Also it was really nice watching Eila and Raef grow as a couple, as well as two of their other friends, who I'll not be naming in case it spoils the story for anyone. 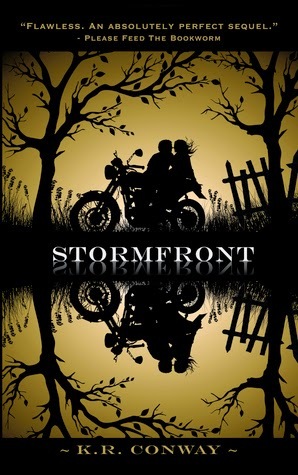 Like I mentioned before, Stormfront is also written in Reaf's point of view, which I loved! It really helped me understand him and why he was so overprotective of Eila. But at the same time, I also agree with Eila. It kind of annoyed me to see Raef treating Eila as if she might break anytime, and being so over the top over protective, even though I know that he only did it because he really loves and cares for her. But even still, I think Eila was pretty strong enough to handle many of the situations and make the right decisions, and I felt that Raef wasn't really that supportive about it. He should have been more confident about her abilites and trusted her, instead of just trying to hide her from every danger that came their way. Nevertheless, as much as some of Raef's actions annoyed me, I still understand why he did it, and was so annoying overprotective. Either way, I still love these two characters, and can't wait to see where they are headed next! As for the other things, the pacing of this book was perfect! Stormfront is filled with so much twists and turns that it kept me at the edge of my seat throughout the entire read! I love the unique storyline that Ms. Conway has come up with, and really enjoyed reading this book. It was filled with twice the action, mystery, and romance than it had in the first book. Overall this was a great, fantastic book, and I am now eagerly waiting to read the next one!